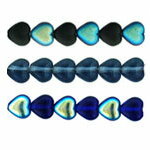 Glass Angel Wings Beads in 15mm and 10mm sizes. 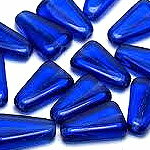 These pressed glass beads from the Czech Republic are called "bi-cones" or "double pyramids". Please help increase the number of animals helped by The Animal Rescue Site. By telling friends about this fast, free way to provide a bowl of food to an animal in need, you will increase your impact. In 2002, visitors to The Animal Rescue Site generated funding for 11,720,254 bowls of food for formerly abused and abandoned animals currently living in shelters or sanctuaries. We can help many more animals in need, but it depends on the number of visitors to The Animal Rescue Site. More clicks means more food. Thanks so much for clicking every day and telling others how to get involved in helping the 10 million animals who are abused, neglected or abandoned every year. Over ten million animals are abused, neglected or abandoned yearly. Visit The Animal Rescue Site (http://www.theanimalrescuesite.com/home) every day to give a bowl of food to an abandoned animal -- at no cost to you -- and participate in the fight to save animals in need. where the X represents a Greek chi, the first letter of , "Christ." In this use it is parallel to other forms like Xtian, "Christian." 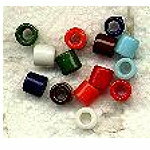 Glass Crow beads, and similar Glass Roller Beads and Metalized Plastic Crow Beads, are either 9mm (with a "3.1mm" hole) or 6mm (with 2.1mm hole) beads with large holes that will easily slip 2mm leather. These are widely used in Native American jewelry, as well as hair-wrapping, and to make fun projects like Beadie Babies. Crow beads are being phased out of production in the Czech Republic. As long as we can find distributors with crow beads in their inventory, we will continue to provide them to our customers. Roller beads are taking the place of crow beads. 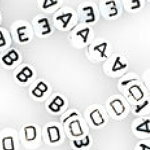 They are about twice the cost, but still an inexpensive bead. 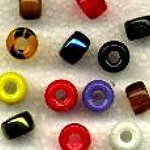 They come in transparent, lined, effects, opaque, metalized and more styles and finishes either in the lining of the bead, or applied to the outside of the bead. 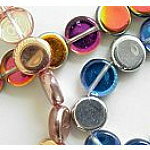 Metalized plastic crow beads are opaque with metal finishes. 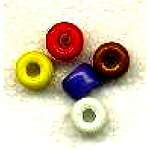 Plastic beads of similar shape, size (9mm) and hole size are called pony beads. Glass "pony beads", however, are something completely different -- smaller in size and hole and with a very different "feel" about them. 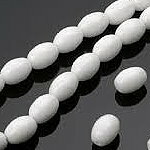 Druk beads are smooth, roundish, plain-Jane beads made in the Czech Republic. 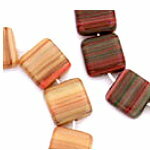 Three-dimensional, square beads are great beads to use in constructing beaded jewelry. 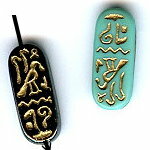 Because of their shape, they offset and complement round beads. 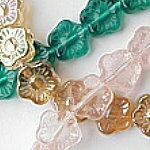 Their use in a piece often serves to make more centerpiece beads stand out even more. 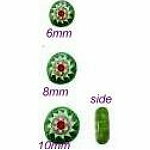 These 6mm glass beads have a rosebud design. Several colors are available. 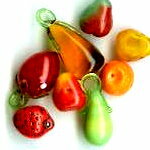 Fire-polish glass beads are made in the Czech Republic, and have at least one facet on them. 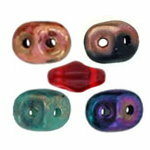 These glass beads are pressed in a mold, then machine faceted and polished. 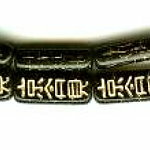 The fire-polishing technique produces a scratch-resistant bead with slightly rounded facets. 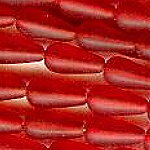 Fire polish beads come in many shapes and varieties, including round, oval, teardrop, belly donut, fluted, renaissance, rosebud, bicone rondelle, rondelles, nuggets. Many artists uses these as "buttons" for button clasps. 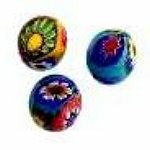 These handmade Czech beads are some of the most popular beads in the store. 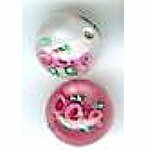 There is a core bead which is a dominant color with points of green and pink in the center to look like one or more roses. 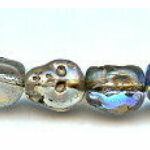 Around this core bead is a polished layer of clear glass. 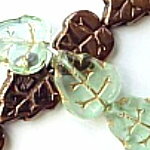 This clear glass gives the bead a very 3-dimensional, very mystical depth. The colors from batch to batch vary widely, especially the purple (lavender to dark purple), the pink (very pink to very similar to the rose color), and the aqua (clearly aqua to mint green). The purple is usually dark purple. The pink and aqua are very variable. 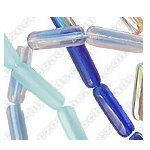 These flat glass disc beads are 6mm in diamete, and 2.5mm wider. Their hole size is small, and is best suitable to tigertail. 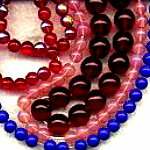 The quality of these beads is not great, so we recommend that you order more than you need. 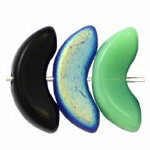 INSPIRED BY MOOD JEWELRY OF THE 1960S & '70S THESE THERMO-SENSITIVE LIQUID CRYSTAL BEADS CHANGE COLOR AS YOU WEAR THEM. 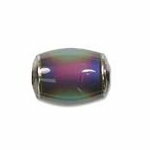 MIRAGE BEADSTM ARE THERMO-SENSITIVE AND CONTINUOUSLY CHANGE COLOR WITH SUBTLE TEMPERATURE VARIATIONS RANGING FROM BLACK (WHEN IN THE FREEZER) THROUGH ALL THE HUES OF THE RAINBOW. 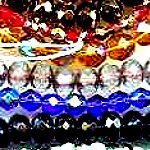 LIKE LIFE ITSELF MIRAGE BEADS ARE ALWAYS CHANGING AND MYSTERIOUS! 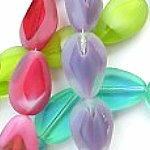 THESE BEAUTIFULLY TRANSLUCENT BEADS ARE SOLD BY THE STRAND. PLEASE NOTE THAT ALTHOUGH THEY ARE VERY DURABLE THESE BEADS SHOULD NOT BE SUBMERGED IN WATER. 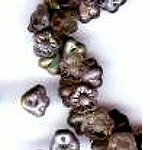 Picasso beads have a goldstone marbling or mottling; that is, they have streaks of gold color running randomly through them. Their color is a bit off-center. 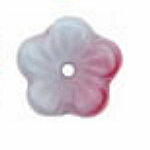 For example, the white has a strong underlying pink tone. The Brown is very mustard gold. The Yellow is a greenish-yellow, and gets yellow-er over time. The red is very red-orange. The pink very salmon. The color varies widely from batch to batch, especially the greens. The white fades in sunlight, making the color go from a very pinkish to a white. The pink color is more expensive than the other colors. NOTE: These beads are no longer in production. As supplies of particular colors run out, that's it. It usually takes many years for supplies to run out, but the more popular colors will disappear. As of 10/15/04, black and red are no longer available. Tile beads are made from sheets of glass or ceramic. These sheets are rolled over a round shape, the ends fused together. Then these rolled sheets are sliced. 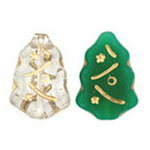 There are different types of tile beads made in many countries in the world. 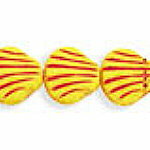 Right now, we have tile beads from the Czech Republic. 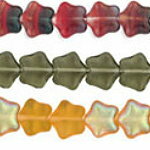 Czech glass tile beads are very simple, basic, thin walls of glass with a large opening that easily slips 2mm leather. 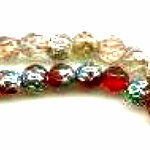 The colors are shiny and very consistent within each bead and from bead to bead. The 5-6mm beads have a large opening that will slip 1mm leather. These Tile Beads are no longer produced in the Czech Republic. As our suppliers run out of colors, that will be all that there is. The colors "black, red, and brown" are no longer available. White is near its end. 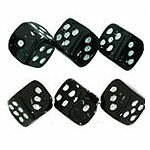 Click the TILE BEADS link to pull up the price/availability sheets. 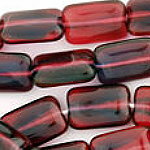 Window Pane Beads (or "Hand-Cuts" or "Table-Cuts") are reproductions and modern interpretations of classic vintage glass beads made in East Germany in the early part of the 20th century. 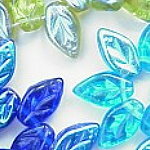 These pressed glass beads have beveled edges, often frosted. 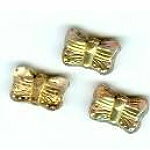 They work well as pendants, or as part of a string of beads in a necklace or bracelet. The supply of these beautiful beads, unfortunately, is extremely variable. 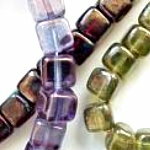 NOTE: Sometimes cathedral beads are also known as "window pane beads". Glass beads have been made for about 9,000 years. They come in all shapes, colors, finishes, appearances. For most of their history, glass beads were more than a craft, more than an art. They were equivalent to money, and were traded. Most fancy glass beads and drops in these displays are from the Czech Republic. 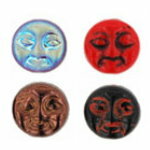 Most often, these are pressed glass beads in many shapes, sizes and colors. 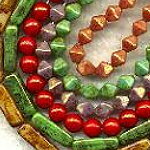 We've tried to include a wide variety of beads here, including many wonderful 4-6mm rounds, ovals, faceted ovals and the like which can be used in many of your creative beading projects. Land of Odds Bead Shop offers a wide selection of glass beads, from Austrian crystal to tile to cloisonne to Czech and East Indian. 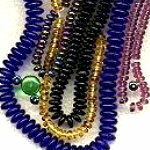 Our newsletter, The ODDSIAN, offers charts about the number of beads by size of bead to the inch, as well as standard bracelet, anklet, choker, and necklace lengths for males and females.